Let your style come alive with fashion dress shirt and tie sets by Daniel Ellissa. Daniel Ellissa specializes in fashion dress shirt and tie sets in the latest colors and patterns for men that are nothing but innovative. 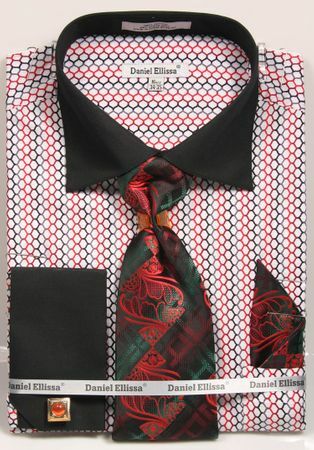 This black and red link pattern dress shirt features black collar and french cuffs that are solid in contrast with the fancy link pattern on the body. Made of cotton.